Why is Food Safety Manager Training Necessary? Food safety and sanitation are integral to operating a successful food service. The safety of our food supply is a responsibility shared by consumers, producers, sellers and handlers. The Center for Disease Control (CDC) estimates that because of foodborne illness 76 million people fall ill, 325,000 are hospitalized and 5,000 Americans die annually. * Because of these alarming statistics, many states require certification of food managers which may include a food safety exam. Why is a Food Safety Course so important and why do some states require it? The answer is very simple. Every consumer deserves and has the right to be served food that is safe to eat. A Certified Food Protection Manager (CFPM) is a certification that is obtained by the owner or employee of food facilities that prepare, handle, or serve non-prepackaged potentially hazardous food. The Certified Food Manager (CFM) Training Program accredits and licenses training programs for candidates new to the food industry who may need training. Our Learn2Serve Food Protection Manager Certification is approved by the American National Standards Institute and the Conference for Food Protection (ANSI-CFP). This accredited exam is accepted in all states that have mandatory certification requirements for Food Management Professionals. A candidate must pass a food safety examination from an accredited certification provider as recognized by ANSI-CFP. The certificate will be valid for a maximum period of 5 years. The exam will be proctored by an employee at the 3rd party test center location. A 3rd party test center is a location outside of your company location. 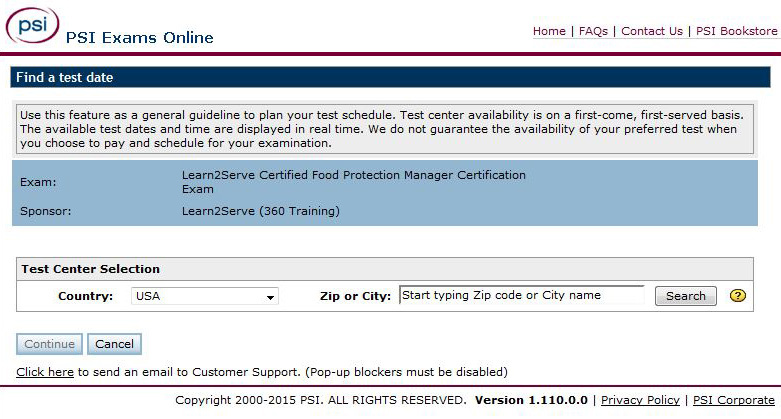 To Schedule Your Exam Online (Log into PSI Exams and search for Exam Providers in your area – see screenshot below): After purchasing the exam, please click here to schedule your exam.